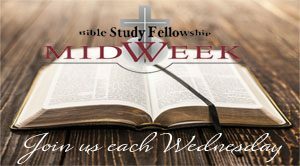 The Mid-Week Bible Study Fellowship meets from September through May on Wednesdays, 6:30 – 8:00 PM, in the church sanctuary. Everyone is welcome to attend. Join us for a study through selected Psalms with Pastor Kent.